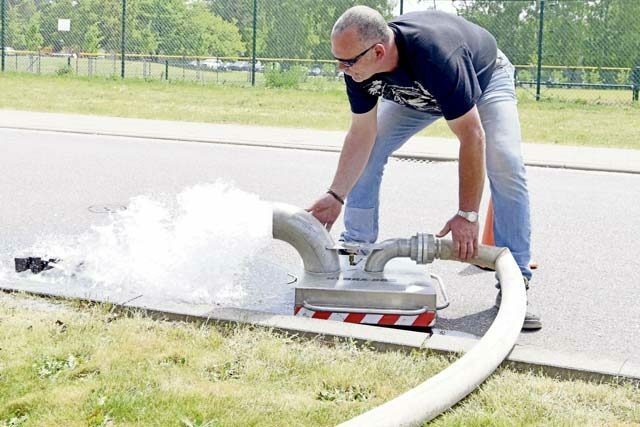 Thomas Bredel, water plant mechanic, 786th Civil Engineer Squadron, tests the water pressure of a fire hydrant May 9 on Ramstein Air Base. Hydrant flow tests are conducted every spring. The 786th Civil Engineer Squadron is conducting water hyrdrant flow testing throughout the Kaiserslautern Military Community for the next several weeks. There are two purposes for the hydrant flow test, said Tech. Sgt. Laurnel Blount, 786th CES utilities noncommissioned officer in charge. The water plant contractors are doing a full system flush, so residents’ water might be brown for a short period of time. Some water around base does become stagnant, so the hydrants are opened to allow old water to flush out and fresh water to flush in. “Hydrant flow testing is required to be conducted annually, but we do it as needed,” said Blount. The hydrant flow tests are vital for maintaing the quality of water on base as well as ensuring that lives can be saved when necessary. 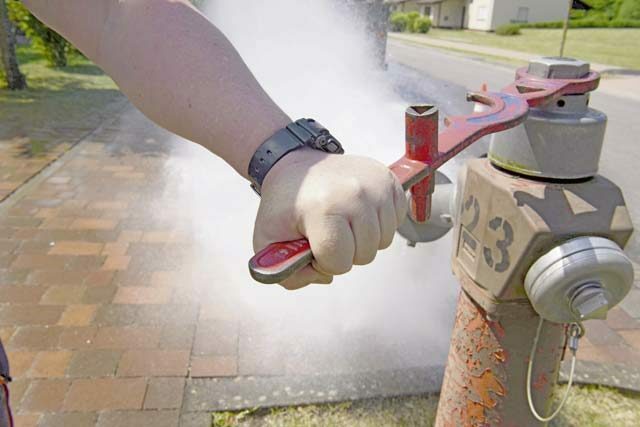 Thomas Bredel, water plant mechanic, 786th Civil Engineer Squadron, turns the wrench to test the water pressure of a fire hydrant May 9 on Ramstein Air Base. Bredel has worked for the water plant for 5 years and likes that this part of his job allows the fire department to be prepared in case of emergencies. 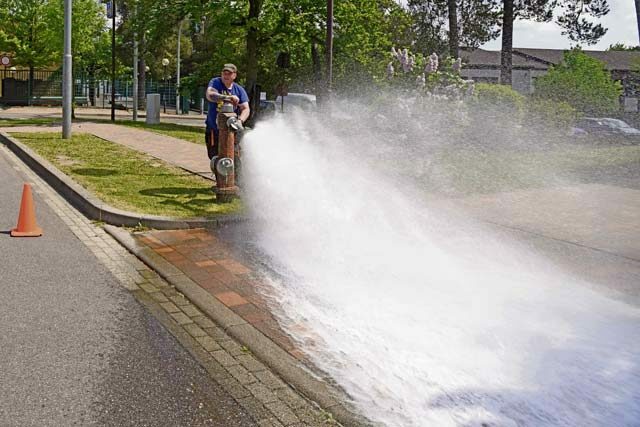 Volker Gehres, water plant mechanic, 786th Civil Engineer Squadron, flushes out a gutter near a fire hydrant May 9 on Ramstein Air Base. Gehres has worked for the water plant for 15 years. 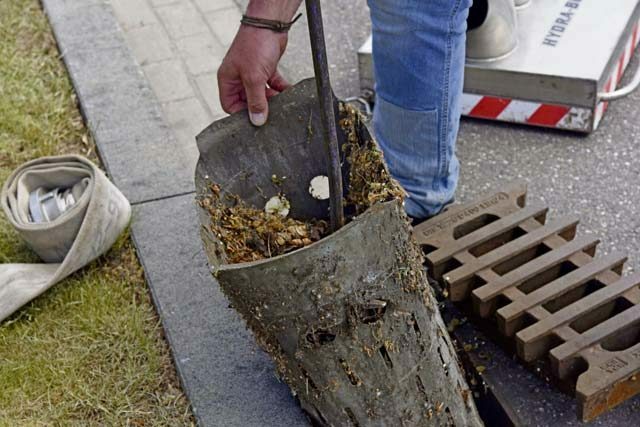 Volker Gehres, water plant mechanic, 786th Civil Engineer Squadron, cleans out a gutter near a fire hydrant May 9 on Ramstein Air Base. Gehres cleaned the gutter to prepare for the water that will be flushed out during the test. Some military members transitioning from the U.S. armed forces will soon have a new boss — themselves.